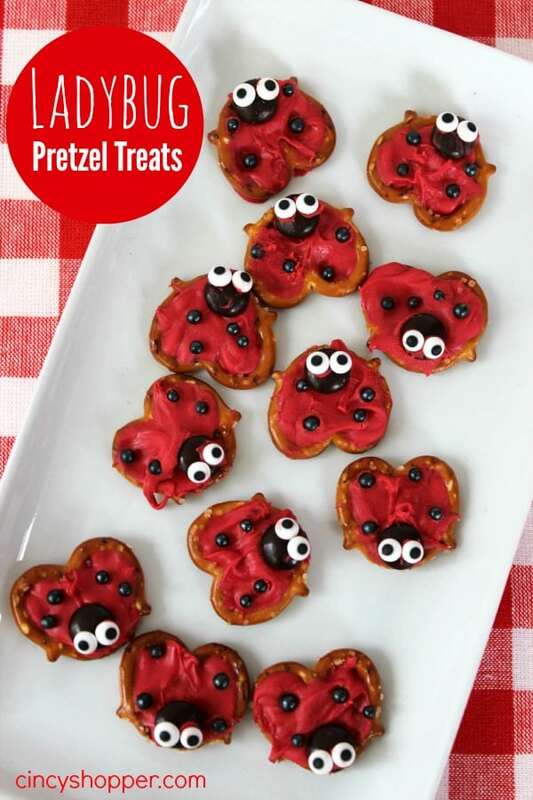 If you are needing a quick and easy treat for some of those cook outs this summer consider making these Ladybug Pretzel Treats. My kiddos and family loved our Easter Chick Pretzel Treats so much, I figured it was time to whip up some pretzel treats for the summer picnics and snacks. 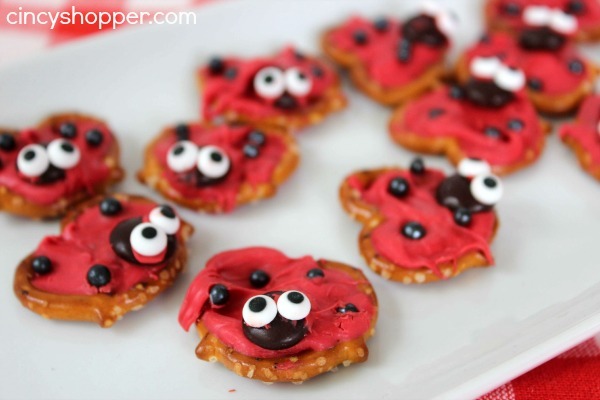 This Ladybug Pretzel treat Idea is so simple even the kiddos can help out with making them. Just grab some pretzels, chocolate and a few candies. The sweet and salty together is perfect! Plus they are adorable. 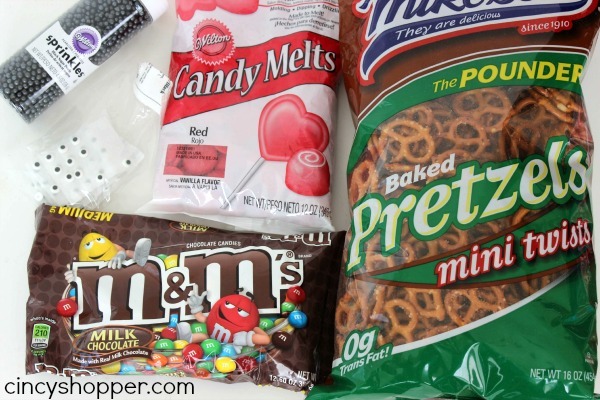 Look around your cabinets for different candies that will work for dots. You could also pipe black chocolate for the dots and white chocolate for the eyes. Use a small dot of melted chocolate as “glue” to attach eyes to head. I made these Ladybug Pretzel Treats this morning. I am going to let the kiddos enjoy them for an after school treat. I am thinking they will be great for our next grill out with friends. Pipe candy over inisde of pretzel to fill completely. Smooth with finger if necessary. How adorable are those. What a clever idea and so much fun for the kids. I need to make these with my grand kids. These are so cute! 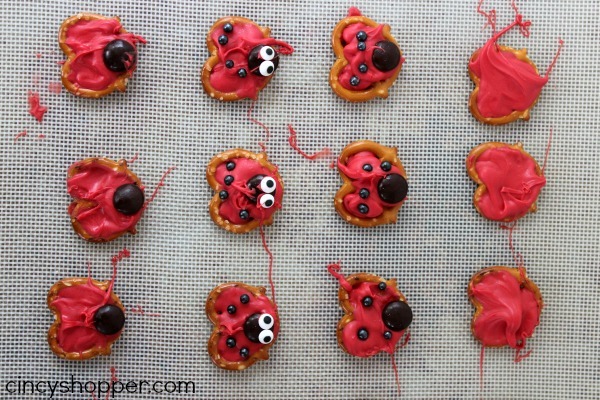 I have 2 and 4 year old daughters who would enjoy making and eating these. Thanks so much for sharing. I’d be thrilled if you’d link up at this week’s Off the Hook! These are just TOO CUTE!!! Thank you bunches for linking up and partying with us! Pinning this! Oh how ADORABLE!!!!!! These are just so cute! These are so fun! Perfect for a picnic. Pinned! These are too cute! I have to try this. these are *SO* cute! Have pinned it to my pinterest board named food to ogle at! These are so cute! TFS! These are adorable!! Pinning them to try!